Russell Wilson said he wants to help bring the NBA and NHL to "the best fan base in the world." The Seahawks quarterback has joined entrepreneur Chris Hansen in his bid to have an arena built in the Sodo District. 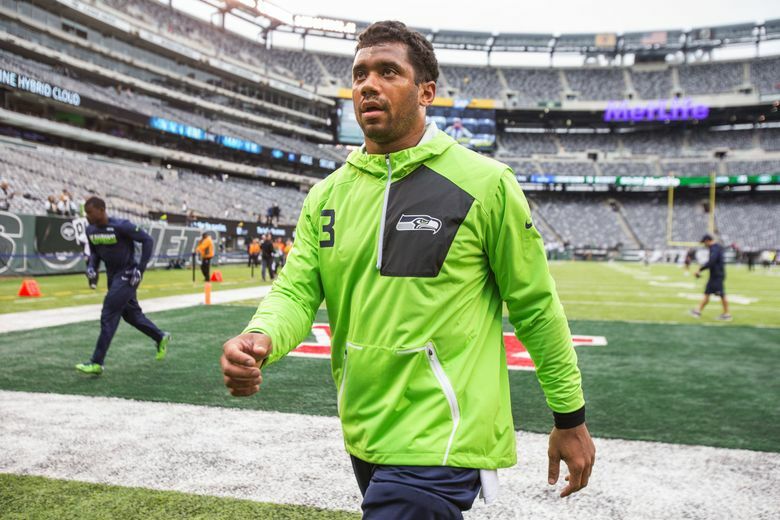 Seahawks quarterback Russell Wilson has joined entrepreneur Chris Hansen in his bid to have an arena built in the Sodo District. A statement issued by Hansen soon after called Wilson his “business partner” and stated: “We couldn’t be more thrilled that Russell is joining our partnership and continued efforts to bring the NBA and NHL back to Seattle. “As you are all aware, we have always kept our focus on doing this for the right reasons – Our love for the City, our love of basketball, and our belief that pro sports has the ability to positively influence our youth and bring communities together in a way very few things in this world can. The addition of Wilson, arguably the city’s most popular sports figure alongside Felix Hernandez, should provide a public-relations boost for Hansen as he heads into direct competition with two California-based groups looking to remodel KeyArena for NBA and NHL purposes. Hansen’s group recently announced plans to submit an all-private Sodo arena funding proposal to the city. In the meantime, the city has announced it will issue a request for proposals to renovate KeyArena. Two highly regarded arena management companies – AEG and Oak View Group – have said they plan to offer renovation bids after the proposals go out in January. The city hopes to receive answers to the proposals by June 30 and then likely will choose between the KeyArena and Sodo projects. Wilson previously had offered public support for Hansen’s project, after the Seattle City Council voted down a motion in May to give up a part of Occidental Avenue South where the arena is to be built. Hansen’s project had been in limbo since the Occidental vote. But three weeks ago, he announced he was scrapping plans to seek up to $200 million in public-bond funding to build the venue. Instead, he says he’ll now go with all-private construction and seek some tax concessions. The city wants time to study any new proposal, which has yet to be submitted, to see whether the tax breaks would offset the benefits of all-private construction. The city also will weigh the benefits of Hansen’s new proposal against the financial losses KeyArena is expected to incur due to a loss of events if a Sodo arena gets built. KeyArena is a city-owned asset that turns a yearly profit. Of prime concern at KeyArena is its smaller footprint and whether a proper renovation can be done without removing its iconic roof and triggering a claim for historical-preservation status. A report by the AECOM architectural firm last year stated such a renovation could be done to provide a modern, high-technology arena of smaller scale – much like the new Golden 1 Center in Sacramento. Also on Monday, the Arizona Coyotes announced plans for a new NHL arena in Tempe, Ariz., that it would share with Arizona State University. Of note: The arena would hold a little more than 16,000 seats – similar to what the AECOM report envisioned for KeyArena in one of its two re-designed models. Smaller arenas have become a modern NBA and NHL business trend as teams look to generate more sellout crowds – a move that heightens ticket demand and leads to increased sales of season tickets. Hansen’s group knows it faces a challenge in coming months to show its proposal is the best one for the city. It isn’t known how big a financial partner Wilson would be in a group that includes brothers Peter and Erik Nordstrom and former Sonics executive Wally Walker. But Wilson’s presence could prove more valuable than his wallet; giving the Hansen group a marquee sports figure beloved by Seattle fans and capable of attracting other athletes and investors into the project’s fold. Wilson’s presence also puts political pressure – given his popularity – on Seattle politicians deciding whether to once again decide against the Sodo arena.